Visual Composer Website Builder is a drag and drop editor which means you can control your layout via drag and drop option. 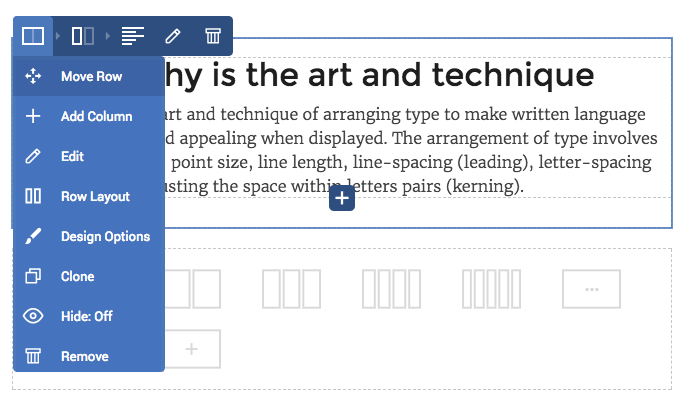 With drag and drop, you can rearrange the structure and elements of your layout. Move elements across different row/column. To perform drag and drop you can use element controls or clicking and holding your mouse on the element. It is also possible to drag and drop element by using an element icon. To finalize drag and drop, simply release the button of your mouse once you see the exact placeholder located in the place where you want to set element. Note: You can also drag element directly from the Add Element window into your canvas (to place them in the specific place).